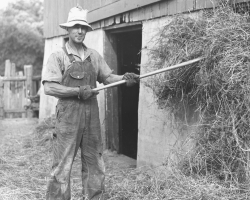 My grandfather, Stanley Newhall, was born in 1889 on a dairy farm near Owatonna, Minn. He died on that same farm 89 years later. 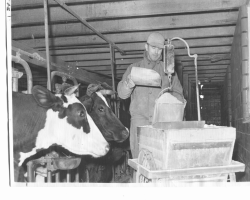 He was one of the first farmers in his area to get milking machines, thanks to the coming of rural electric power in the 1920’s. He was also something of an inventor who was featured several times in various publications over the years. My 92-year-old father, Bill Newhall, has spent a lot of time organizing old family photos. He recently came across the photos above that appeared in national farm magazines. My grandfather had a lot of “made it myself” equipment around his place that often caught the eyes of farm magazine editors. I like to think we would have featured a few of them in FARM SHOW if the magazine had been around during his day. Pic on left shows my grandfather, Stanley Newhall, struck a pose in the 1930’s for a feature story in Successful Farming magazine. Pic right shows “made it myself” feed cart that caught an editor’s eye in the 1930’s and earned my grandfather a spot in another magazine.